Yudhisthira, the eldest Pandava, was made the yuvaraja (crown prince) of Hastinapur as he was the eldest prince. This made Duryodhana jealous. With the help of his uncle, Shakuni, he made a plan to kill the Pandavas. They persuaded the Pandavas to attened a grand fair in the town of Varnavat. Duryodhana had a lac palace built for them. Lac burns very easily. He had planned that when the Pandavas were sleeping in the palace, one of his men would set it on fire and they would be burnt to death. Vidura, the prime minister, came to know of this plot and warned the Pandavas to escape. The Pandavas and their mother Kunti, stayed in the palace on fire. 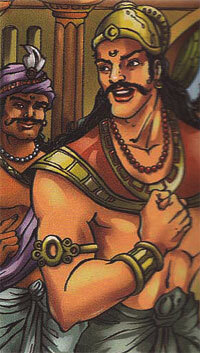 The Pandavas safely escaped through the tunnel and Duryodhana thought that they had died in the fire .